Solanum scabrum Mill., Gard. Dict. 8th ed. Solanum no. 6 (1768). T: Cultivated Chelsea Physic Garden, origin North America, Miller s.n. ; lecto: BM. Coarse annual or short-lived perennial herb to 1 m tall, glabrous or sparsely pubescent with simple, appressed, curved non-glandular hairs; prickles absent. Leaves usually ovate, the lamina 7-12 (-16) cm long and 5-8(-14) cm wide, concolorous, entire or sinuate; petiole 1.5–7 cm long, narrowly winged in upper portion. Inflorescence simple or sometimes branched, (6-)9–12 (-27)–flowered; peduncle 2–3(-6) cm long; pedicels 5-10 mm long. Calyx 1.5–3.5(-4.5) mm long. Corolla stellate, 15–20 mm diam., white, sometimes tinged purple and with yellow/green basal star. Anthers 2.5-3.5 mm long, oblong, brown. Berries globular, 10–17 mm diam., purple-black, 4-10 per inflorescence; fruiting pedicels erect, adhering to fruit. Seeds 1.8–2.2 mm long, pale or stained purple. Stone cell granules absent. n=36. Occasionally cultivated but not known to be naturalised. Its origins are uncertain - Linnaeus attributed it to Africa (as Solanum nigrum var. guineense L., Sp. Pl. 186 (1753)), while the type of the species comes from North America. Part of the S. nigrum or "Black nightshade" group of species, usually referred to as cosmopolitan weeds and usually thought to have originated in the Americas. They are characterised by their lack of prickles and stellate hairs, their white flowers and their green or black fruits arranged in an umbelliform fashion. The species can be difficult to distinguish. Other species to occur in Australia are S. americanum, S. chenopodioides, S. furcatum, S. douglasii, S. opacum, S. physalifolium, S. retroflexum, S. sarrachoides, S. nigrum and S. villosum. A useful reference to the Black Nightshades is J. M. Edmonds & J. A. Chweya, The Black Nightshades. 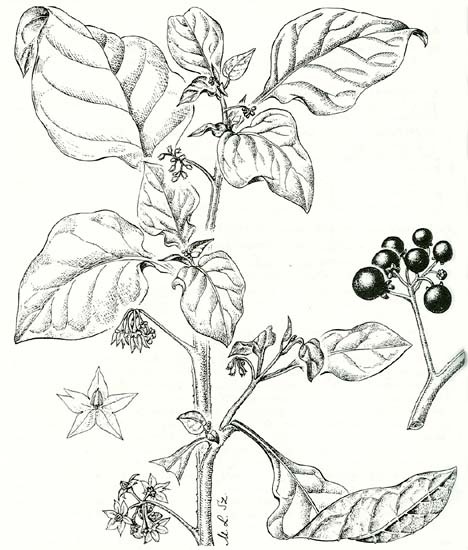 Solanum nigrum and its related species. Int. Plant. Genetic Res. Inst. Rome (1997). Apparently not a particularly important food plant but in African countries the large berries are eaten as well as the leaves. The latter are often used as a vegetable or pot herb (see J. M. Edmonds & J. A. Chweya as cited above). Some members of the complex have long been important food and medical sources in parts of Africa,India, Indonesia and China. Leaves are used as herbs or as vegetables, fruits are edible and provide dye and the plants have been used for various medicinal treatments. However other parts of the complex are poisonous. Because of this it is important to develop techniques for distinguishing between the species and the work to develop genetic markers is ongoing, particularly in Africa where these plants can provide a more easily obtained food resource than imported foods. Of the species which occur in Australia S. americanum, S. scabrum and S. villosum are all considered to be edible. References: Keller, G.B. (2004). African nightshade, eggplant, spiderflower et al. - production and consumption of traditional vegetables in Tanzania from the farmer's point of view. MSc dissertation, George-August University, Gottingen. ; Mwai GJ, Onyango, JC & Abukusta-Onyango, M (2007) Taxonomic identification and characterisation of African nightshades (Solanum L. Section Solanum). AJFAND Online 7(4); Olet EA, Heun M, & Lye KA (2005). African crop or poisonous nightshade; the enigma of poisonous or edible black nightshade solved. African Journal of Ecology 2005; 43: 158-161. A comprehensive fact sheet on S. scabrum in Africa, with images, can be found on the PROTA (Plant Resources of Tropical Africa) site. Information on S. scabrum and its uses can also be found on the Plants for a Future site. Further information, images and links for this species can be found on the Solanaceae Source site.